I know, I know, I have been horrible at keeping up with my blog posts. My New Year's Resolution is to be more consistent (I promise!). Aaand...lol...that being said, I have started a new blog....hehe. And yes, I will be keeping both of them up to date. My new blog will be used to showcase my love of paper and color, and all things crafty :). You can find it here. 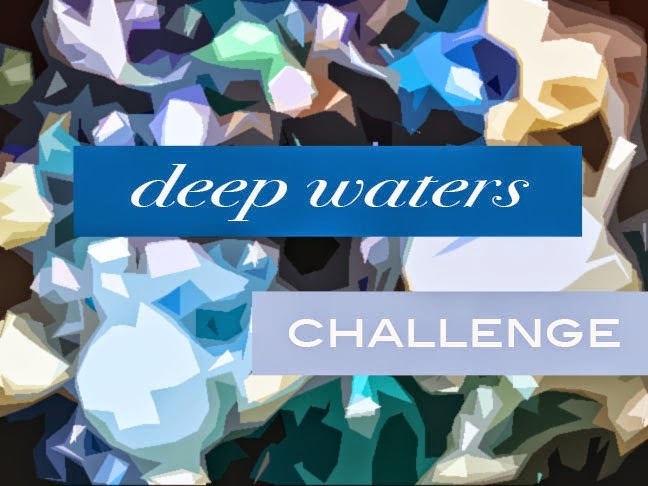 Currently I am working on Andrew Thornton's Deep Waters challenge and have many other new things to show you. 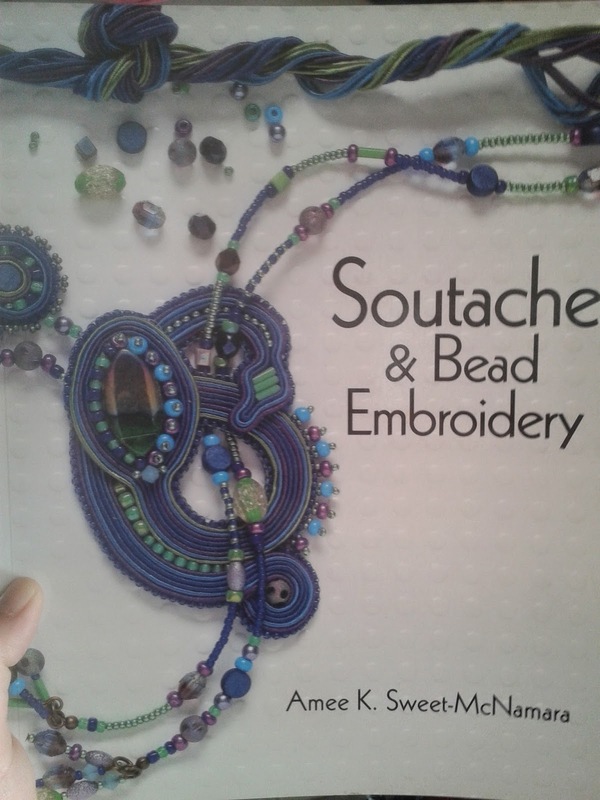 Thanks to Amy at Bead & Glass Boutique, I managed to get my hands on Amee K. Sweet-McNamara's newest book, Soutache & Bead Embroidery. Such beautiful designs! 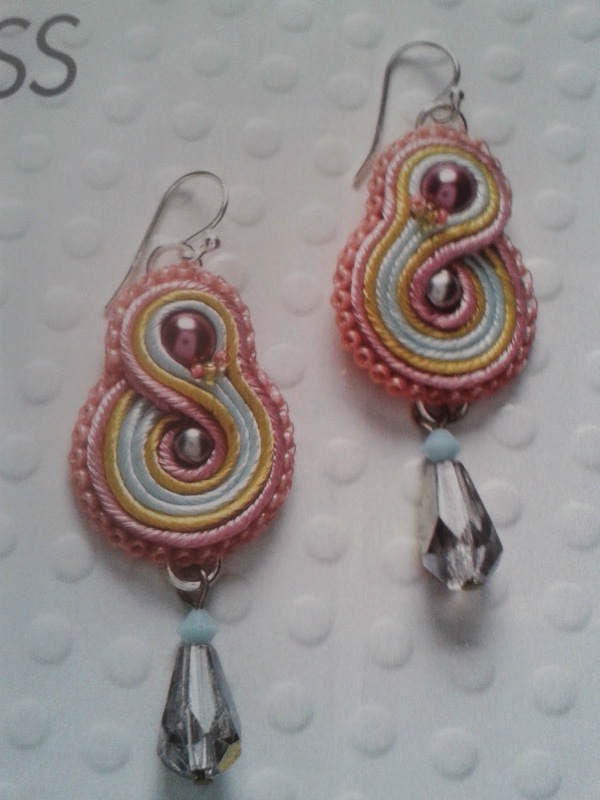 I have tried my hand at soutache a few times, and really love the flow of the braid and the textures when mixed with glass beads. 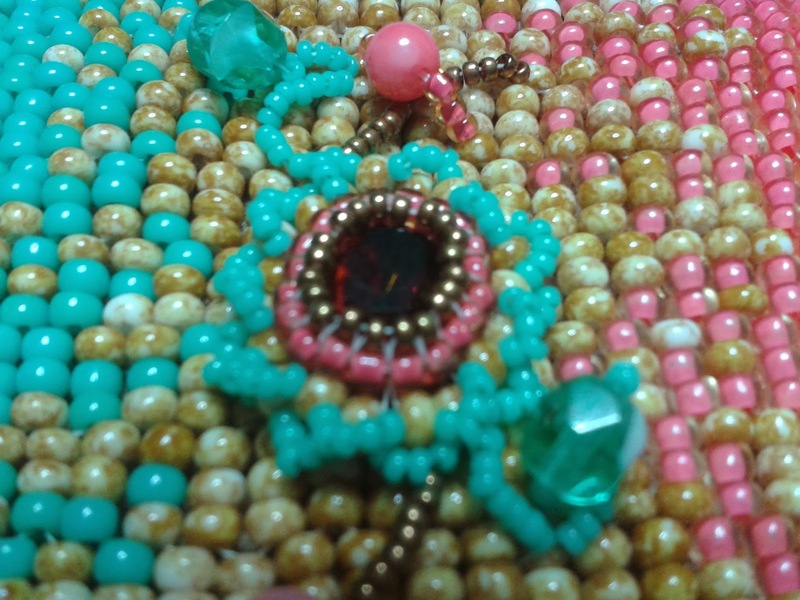 So, I had a thought...I emailed Amee K. and asked her if I could showcase her book and pictures of the finished pieces in her book (NOT the instructions of course, let's make that clear right now...) as I bead along with the book project by project. Her response : "You bet your sweet bippy you're allowed to do that! Blog away Fabulously Crazy Girl!" Ha! I love Amee, she is just so...loveable. My second piece from the book, page 19, Princess earrings, is still in the works. 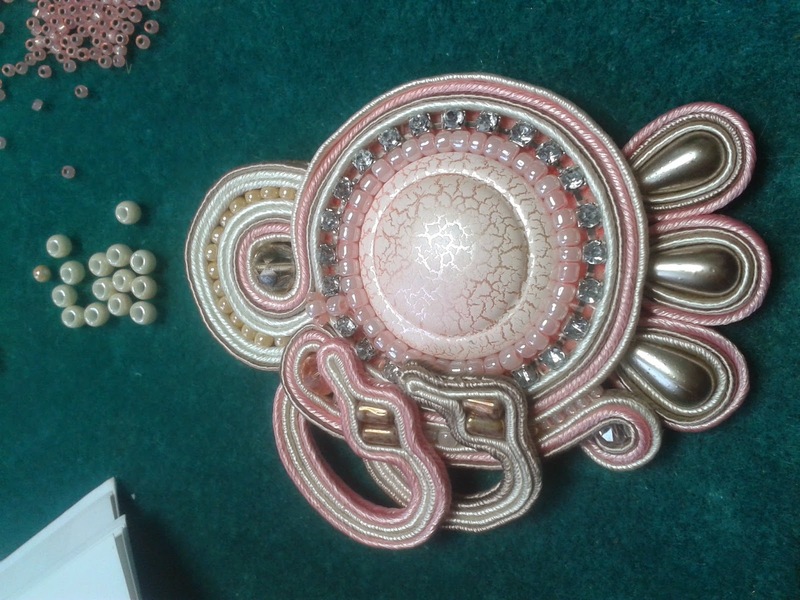 But what a fabulous pattern to use as a base for soutache knowledge instruction. Yes, I should have started at the beginning of the book, but, I am that "fabulously Crazy" girl, as Amee so politely puts it...heehee. Thanks Amee! I will post more pics when I get them finished of course! 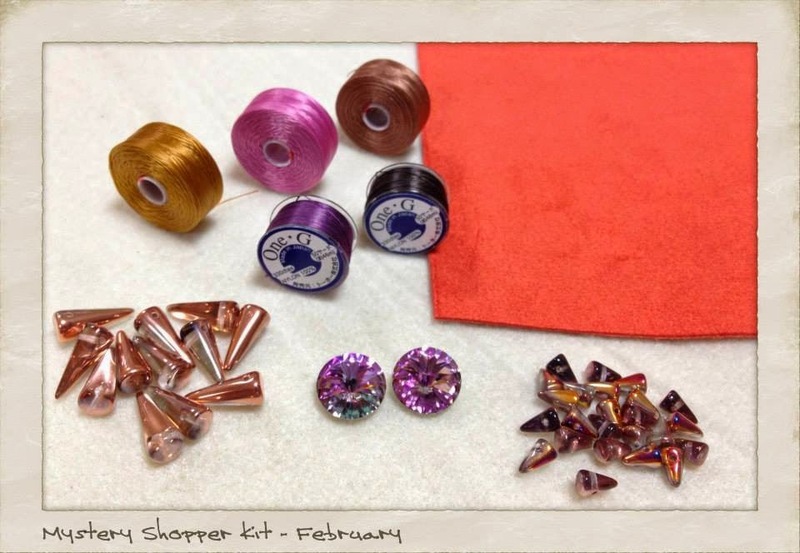 And lastly, for this fabulously long blog post, my mystery kit reveal from Amy at Bead & Glass Boutique ! Between life happening, and well, life happening, Amy and I both forgot about March, but I know that April's mystery kit is on its way as we speak. 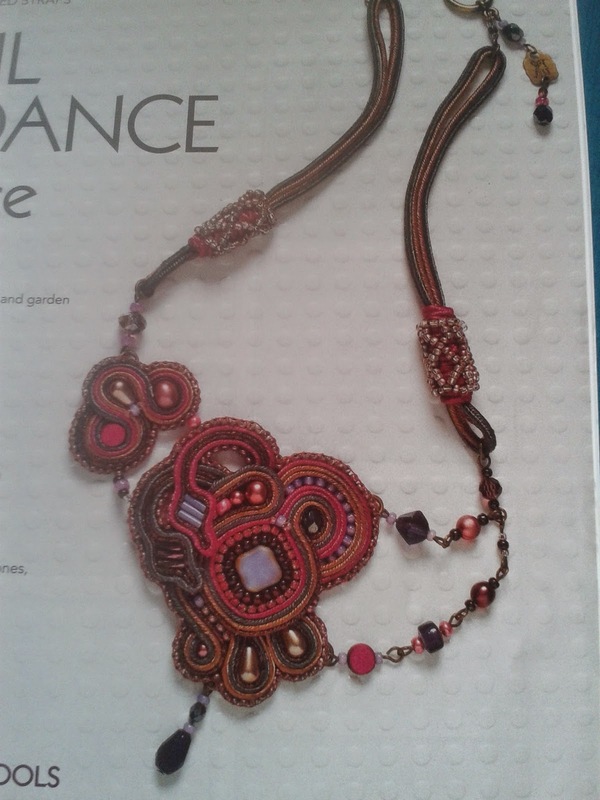 So excited to get it...I could use some beadspiration! 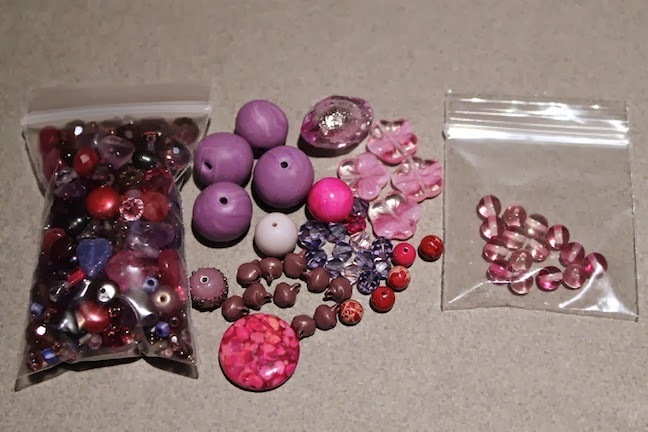 My second Bead & Glass Boutique Challenge kit included lots of pink. Pink, pink, and more pink. Not one of my favorite colors, but I ran with it. Had a great idea right off the hop, and started to get into it right away. Then, of course, life happens right? The kids have to do this or that, the hubby needs this or that, and then there's work, and my other crafty adventures. I blame Shelley Graham Turner for this one. She got me into this Ning Community called My Paper Pantry, and its all about paper crafting, which I also love to do. That being said, my original piece didn't turn out the way I wanted it to. So I revised and ripped out, and started again. HA! Then I realized that Andrew Thornton's Radiant Orchid Challenge was due the day before this one. O Boy! 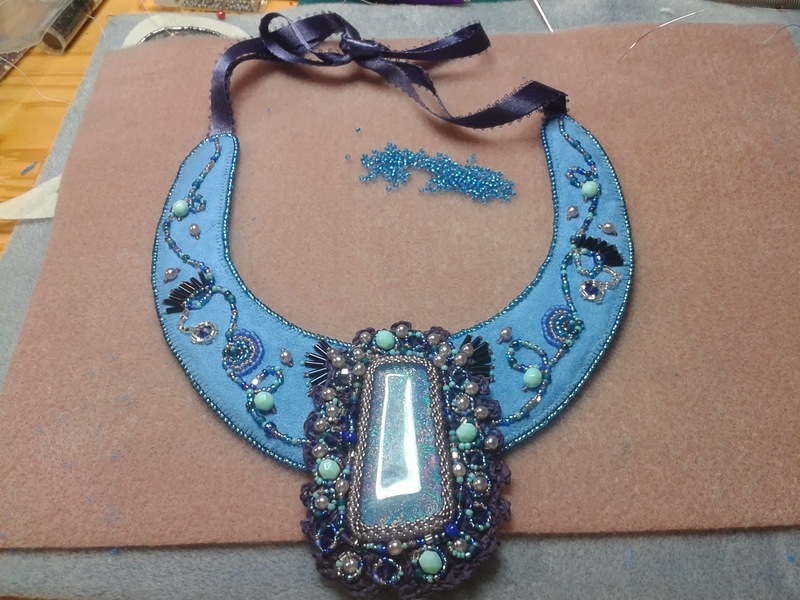 I managed to get the Radiant Orchid Challenge piece finished, but hadn't been able to find the time to finish the Love of Beads Challenge piece. I am sorry Amy. I just couldn't get it done in time. Even after I ordered extra seedies to go with the kit, it still isn't finished. I know, I am a disgrace...lol. I will finish it, it just won't be this week, or this weekend. 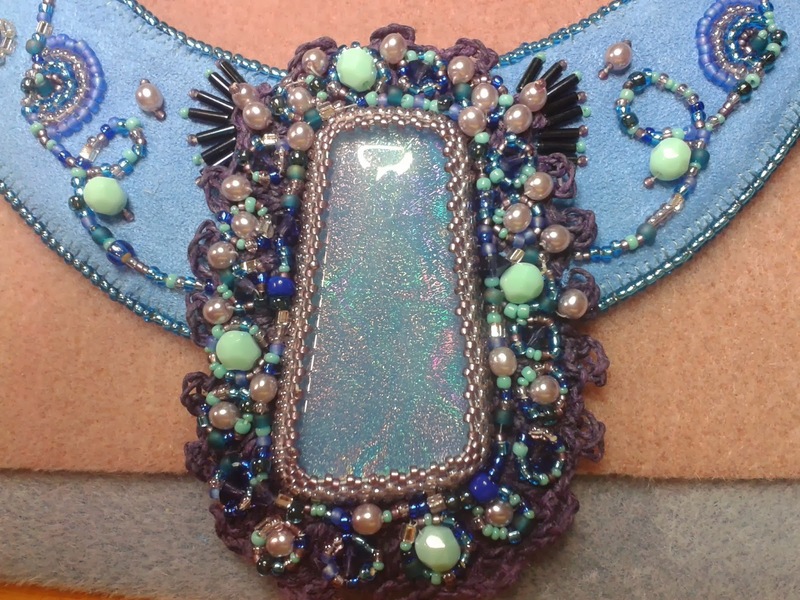 I will post when it's done and hopefully Amy and the Bead & Glass Boutique can forgive me. I just love them to pieces. 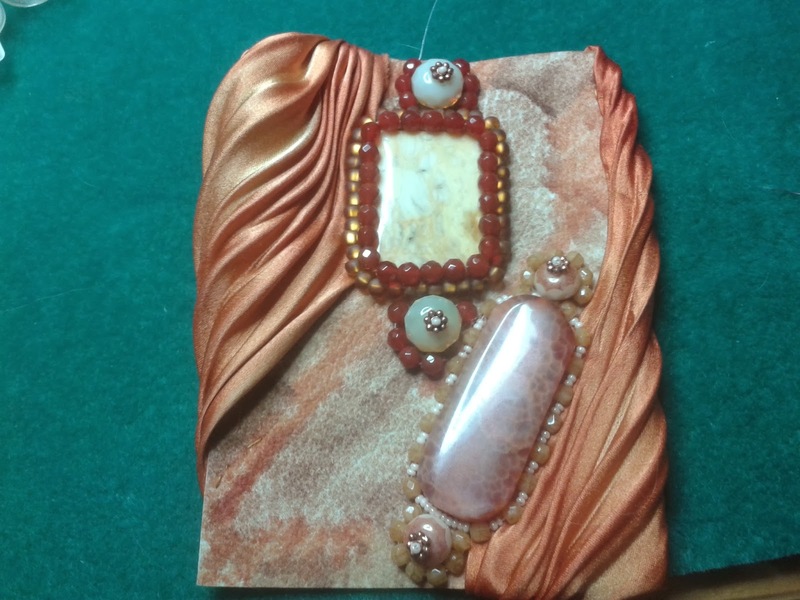 My first ever Bead & Glass Boutique Dreamweaver Challenge was a challenge. I wasn't sure what was going to happen with this kit. Again, I mulled it over for a long time.....before I finally nailed down what I wanted to do. In fact, this is only the second ever piece that I actually planned out and sketched beforehand...lol. I joined this challenge because I loved the colors of the kit (this happens a lot :)). Purples and blues, what a great combination! So, I managed to use almost all of the kit. If you're familiar with their challenges, you have to use 77% of the kit in your piece and only one piece is allowed. My issue is this: in all of these challenges they never include enough seed beads for me :P. I ended up ordering extra waxed linen, and used it to crochet part of the bezel around the cab. So, this is my piece I call it Flight of the Dreamweaver. Not one of my better pieces (and I'm sure that's because I planned it out hehe), but still I think it's a worthy piece. The only things I didn't use from the kit were two colors of rat tail cord. And I used a lampworked dichroic cab made by my friend Judy McCourt, of Annoyed Artist Beads. 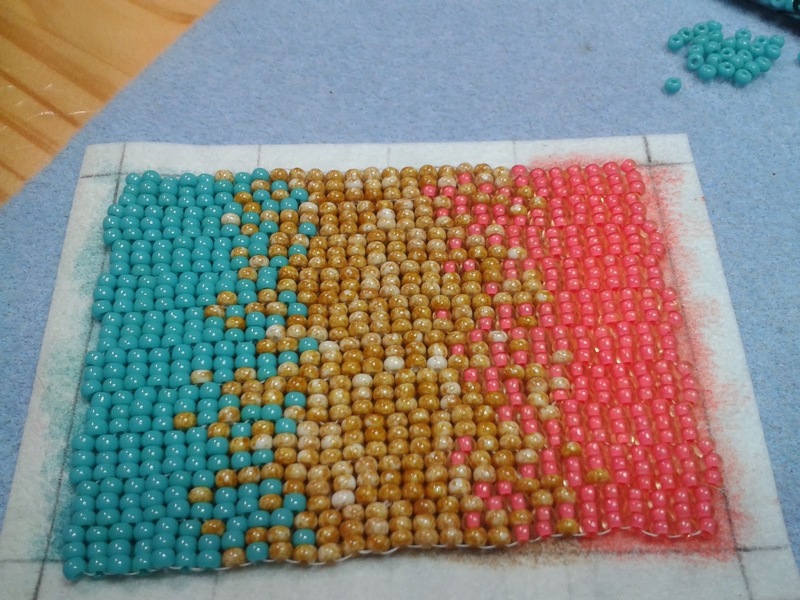 As I was pulling beads and colors, I realized that these colors alone remind me of my parents. The earthy tones and flow of the fabric shouted to me the name, and the rest came with the flow. 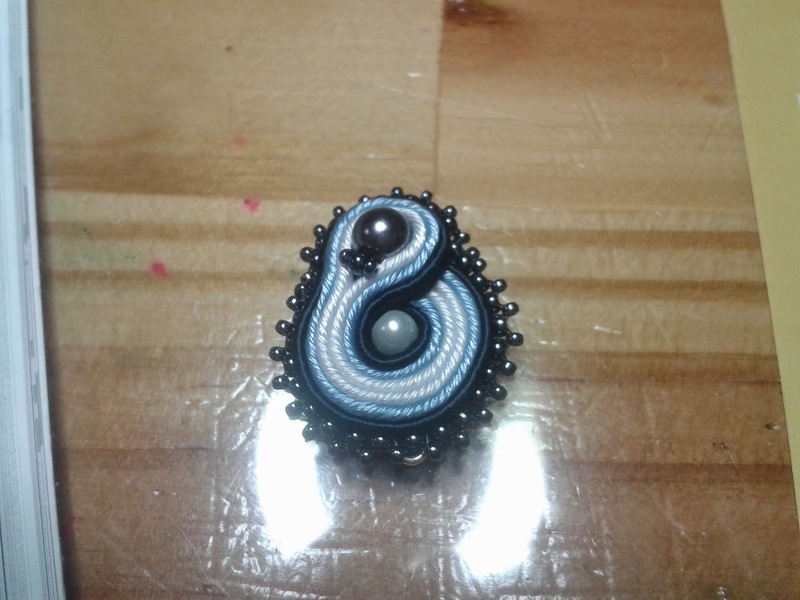 I do a lot of intuitive beading. I find I have trouble planning things out. What I see in my head and what shows up on the paper (when I try and sketch things out) are two very different things. 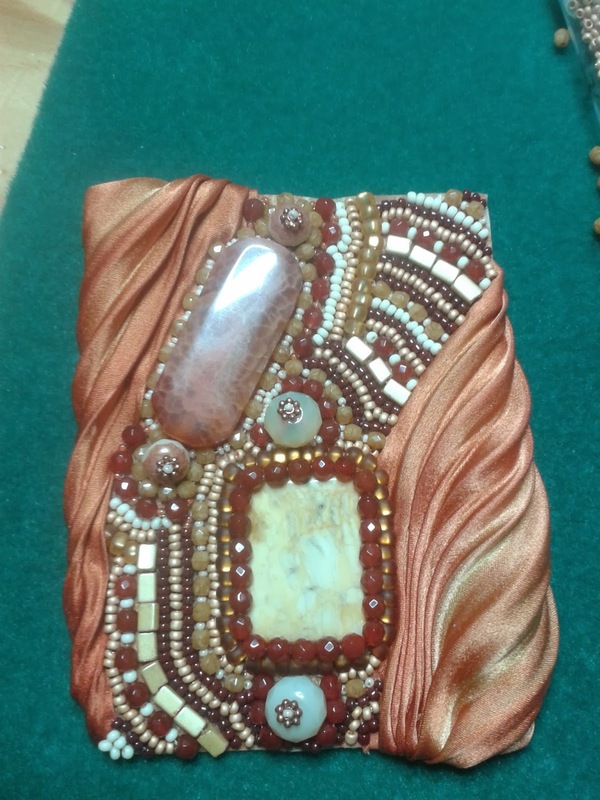 However, I find that once I pick my focal and some of the major beads to go with it, everything else just seems to fall into place. More on my inability to plan a project later...tomorrow in fact...lol. For now, let's discuss this piece. I call it the Pillars of the Earth. For a couple of reasons. One, the colors, obviously. They are beautiful earthy tones. Secondly, the colors and the stones reminded me of my parents and I thought about them the whole time I was creating this piece. They are MY Pillars of the Earth. They are my pillars of strength, of creativity (mom is a painter, dad a woodworker, and both are very musical), they are my grounding influence and have taught me to be the same. They are love and light and all things good, warm and fuzzy. So, in closing, This piece is my tribute to my mom and dad. Thank you for being who you are, and for teaching me the things I needed to know to be a lot like you. I will be putting this piece in a shadow-box frame for them to hang in their home. 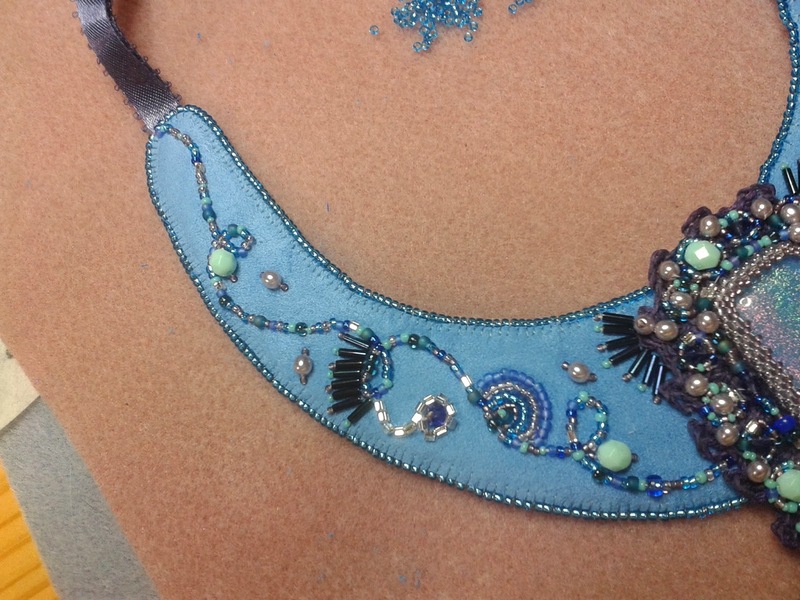 When I heard Andrew Thornton was having a beading challenge, I jumped right in! I love Andrew, and although I have never been there, given how Andrew speaks about it, I imagine Allegory Gallery is definitely on my bucket list! 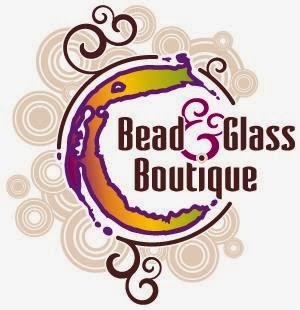 So is the Bead & Glass Boutique in New Jersey, but that's another blog post (which I am also writing tonight :)). Let's get down to business....Andrew sent all the challenge participants a kit which included all kinds of purply goodness. Purple happens to be my all-time favorite color, so how could I not? Now, those of you that know me, you know that I am a seed-beeder through and through. SIGH. 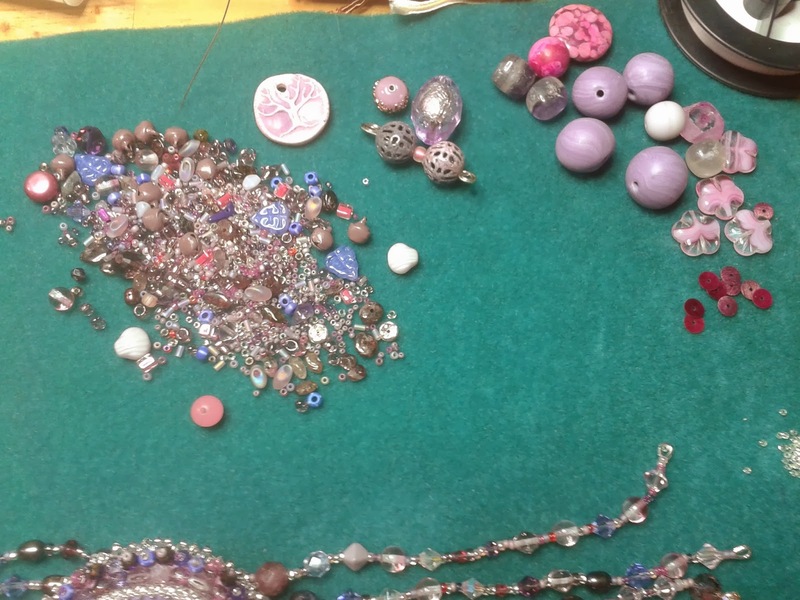 So many challenges I want to be included in, but alas, they focus on a lot bigger beads than I am used to. I have tried and tried and TRIED to work with the bigger beads, but they just don't speak to me. So I mulled over this challenge for quite a while. 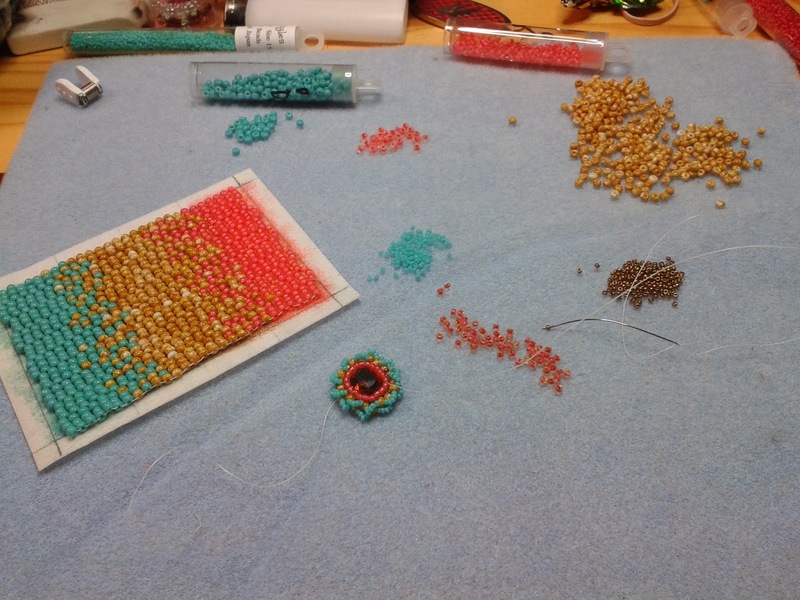 I spilled the beads on my mat, mixed them, separated them again, sighed a few times and put them away again. I did this several times, lol. 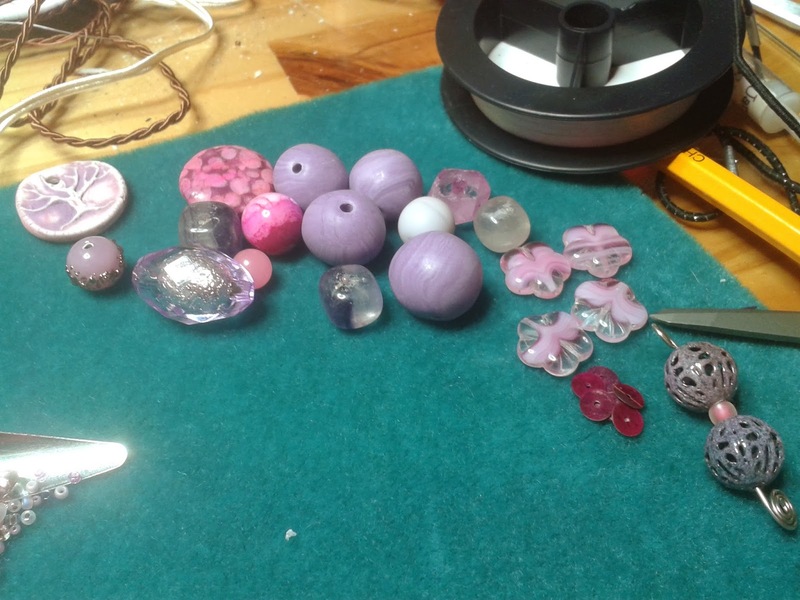 Lots of big beautiful purple beads! And a few seedies in there too! Then I received my birthday present from my loving sister who remembered how much I wanted some cameos to try working with. I received a big baggie full of antique cameos just waiting to be remade into something vintagely modern (yup, it's a word in my world :P) and beautiful. 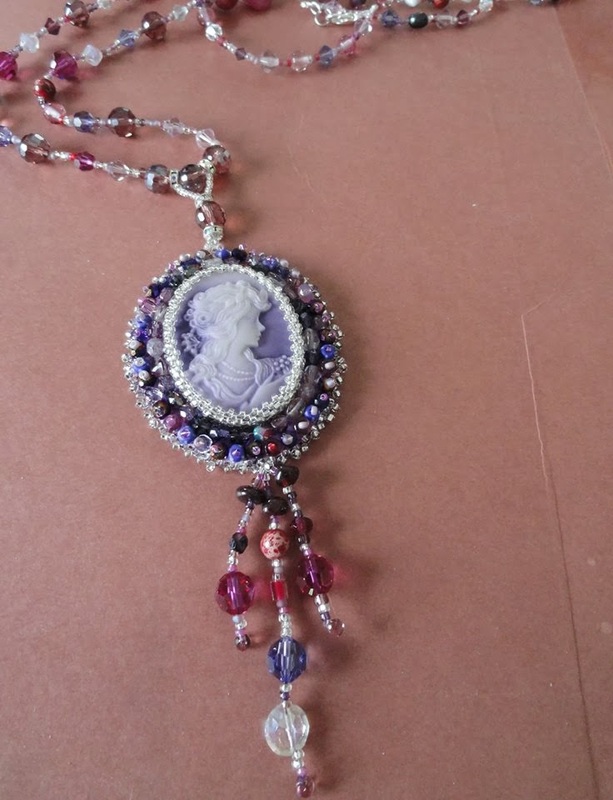 So I pulled out this gorgeous purple cameo and spilled out the beads again, and ALAS! This simple but pleasant design came to me. And as I was putting it together in my head (I very rarely sketch things out - I can't get the design from my head to the paper), all I could think about was my wonderful mother, and that her birthday was coming up, and that cameos remind me of her. She is timeless, and beautiful and absolutely an amazing person. AND, purple happens to be her birthstone, and one of her favorite colors too! This was perfect! So, here is my challenge piece. 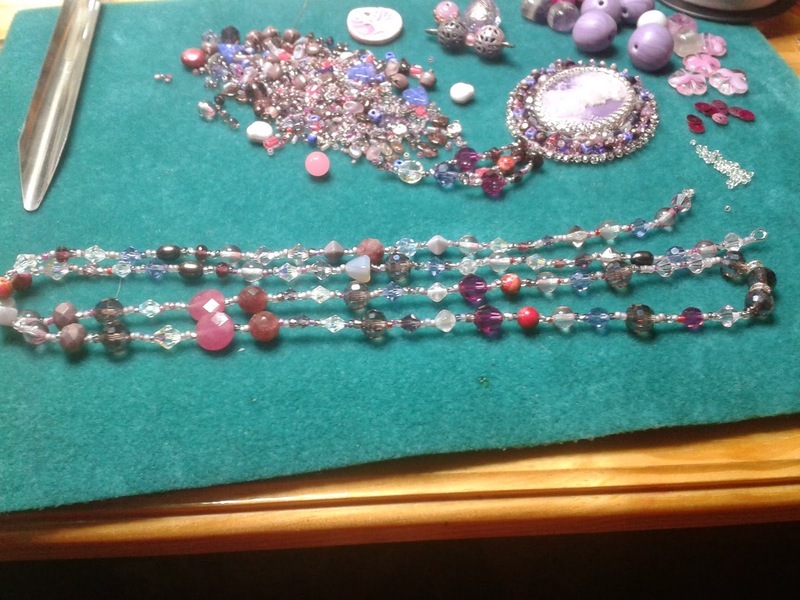 I used all of the beads that I thought I could use, which was way more than I thought at the beginning, and the really big ones I gave to a very good friend of mine is in love with big beautiful beads. Win-win! I am anxiously awaiting Andrew's next challenge and what it may entail! In the meantime, don't forget to visit all the other participants' blogs, as well as Andrew's blog , and Allegory Gallery too! Thank you Andrew for including me! I love a good challenge. I met a new friend on Facebook. Her Name is Amy, and she owns the Bead & Glass Boutique in Pitman, New Jersey. We have become fast friends, and seem to have a ton of stuff in common. I took an idea that I had to Amy and she has run with it...lol...and it's sooo much fun! Then I gave Amy a budget to stick to every month. Now every month, Amy picks out a few things on my list (within the budget of course) and sends me a mystery kit. The kit consists of things I want, need, or love, and come from my list, yes...but, I do not know what's coming every month :) It's a like a Christmas gift for myself every month. I love it! I am currently waiting for my second package to be delivered. My first package came in late January, and consisted of ultrasuede, glue (E-6000), some beautiful Shibori Ribbon, and some superduos in awesome purply colours. 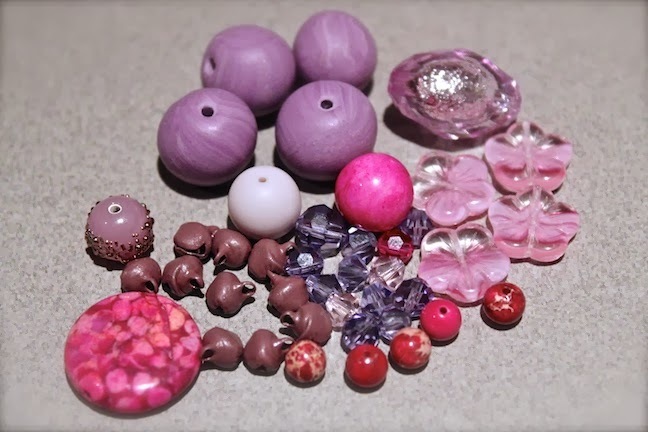 Every month or so, Amy holds an online sale on her FB page, and of course it's very VERY tempting to purchase new beads, they are all so yummy. But Amy will take orders and mail them out quickly. She is very good with customer service and is so easy to talk to. I just my new friend! 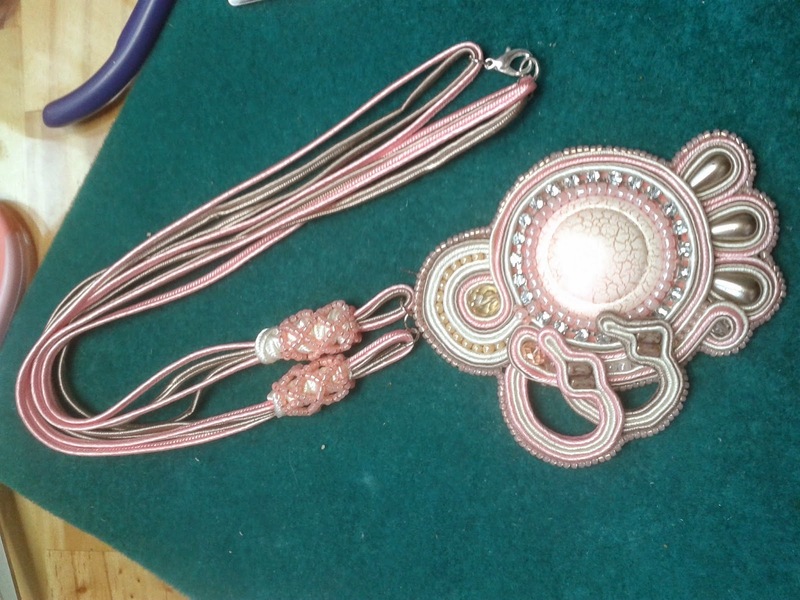 The Bead Journal Project and other fun things! 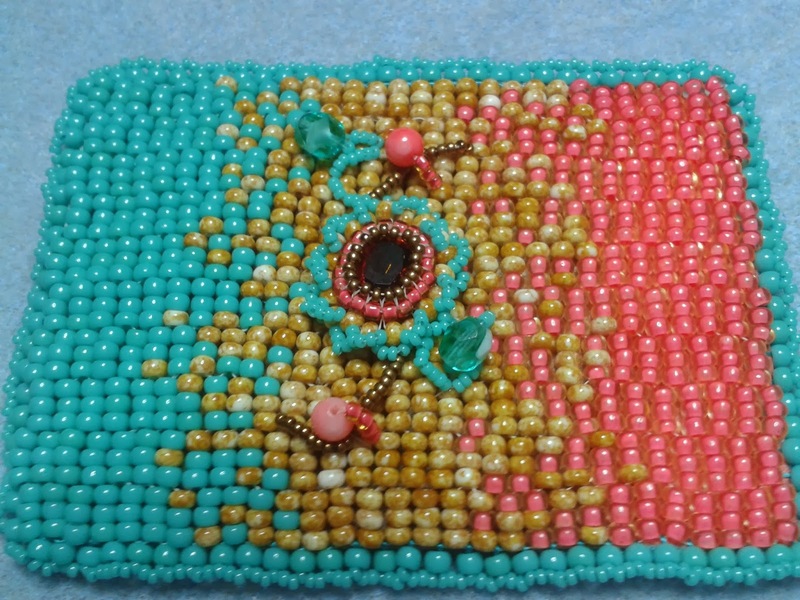 I have recently joined a Facebook page called "The Bead Journal Project". OK, when I first caught wind of this, I was naturally curious...what is that all about? So I requested to join the page, and lo and behold! What a great place! 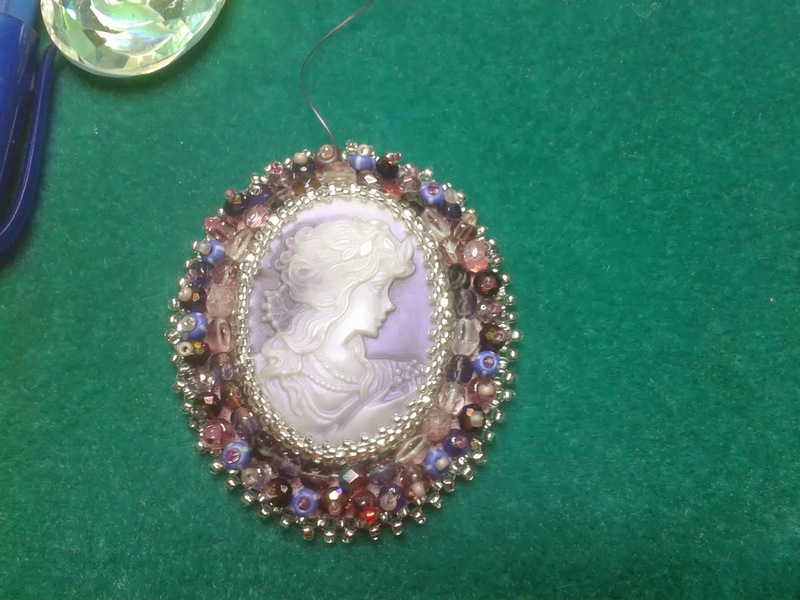 The Bead Journal Project page is full of wonderfully helpful and insightful people who make a bead embroidery piece every month, either around a theme or what they are feeling at that given time. The pieces are reflected upon throughout the year and as they are made, and sometimes put together at the end of the year to form a "calendar" of the past. What a fabulous idea! I have tried to start journals before, either in writing or in art, and always have a really difficult time getting them started. This one wasn't so hard! And if you decide on a size, to follow all year, that isn't so large and intimidating, it can be a quick project or a month-long one. 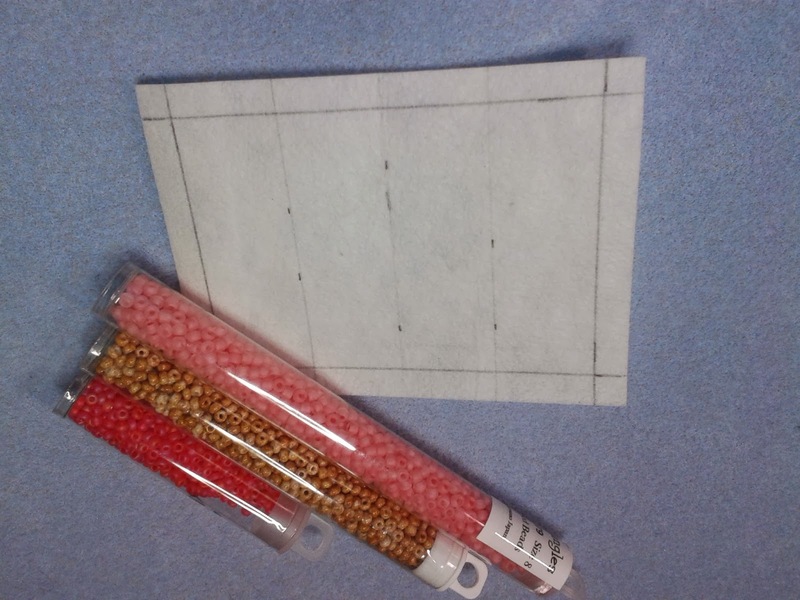 I chose to go with the ATC card size (2.5 x 3.5), which is a nice small size and easy to bead as it is a rectangular shape. The hardest part for me was the colours to choose. Wow, I am a colour nut. I love colours...ALL of them! My kids always laugh at me when I can't decide on colours...lol. 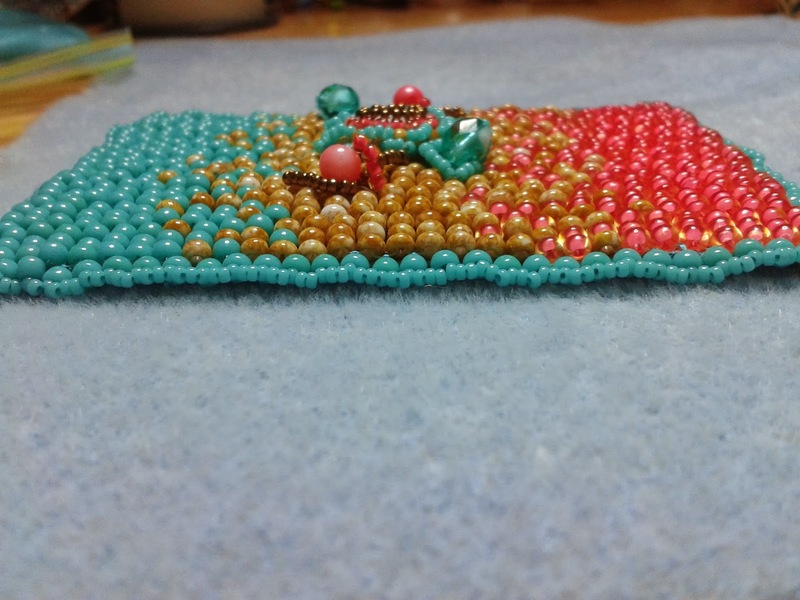 I wanted to start with a background of beads, using the beads as a canvas for some kind of focal. This idea for the background came to me from reading a post on the FB page for Bead Embroidery Forever (what a great name!). Plus, I have never done 3 drop peyote before and wanted to give it a try. I liked this gradual changing of colour because it represents making order out of chaos. I find in my beady adventures that I am in a state of chaos for most of the time, until I really nail down the project idea. This is not where I want to be in my Bead life. I want to be orderly and decided and goal-oriented, just as I am in other aspects if my life. So, all three pieces ready to put together....so what is wrong with this picture? Do you see it? That's right....I should have adhered the background to the embroidery backing BEFORE I sewed the focal on. 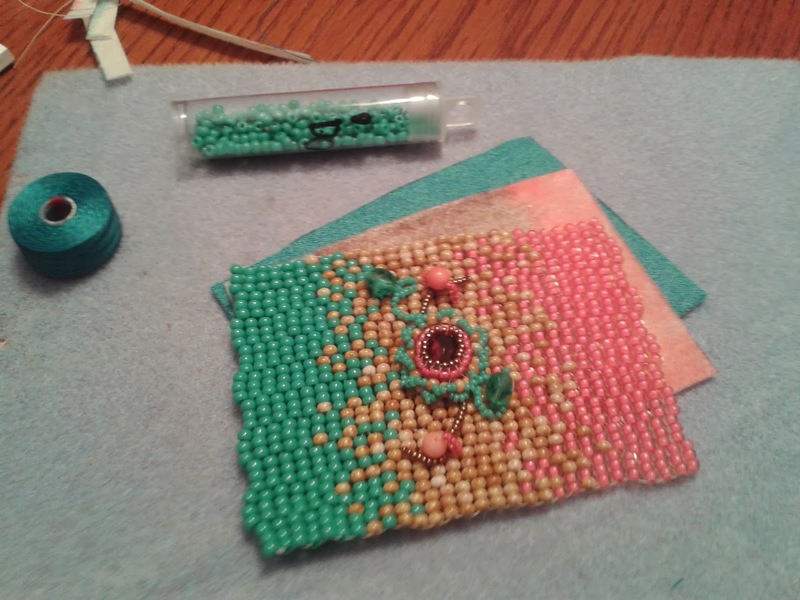 THEN I wouldn't have had some much darned trouble with the vines and such, and the thread slipping between rows of 3 drop peyote size 8 beads...lol! Oh well, life is a learning curve right? Right! After putting the three pieces together, I backed it with sierra suede (yes, I know, not ultra suede, cuz I can't get the stuff here :S), and edged it with a modified picot using 8s and 15s. 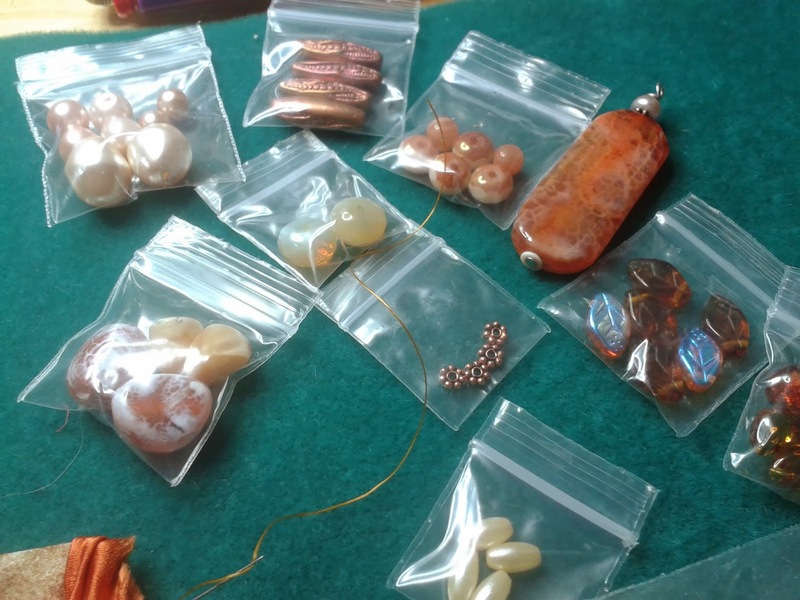 And so begins my journey into the wonderful, yet challenging, world of the Bead Journal Project. I know it will be a fun and fulfilling year! 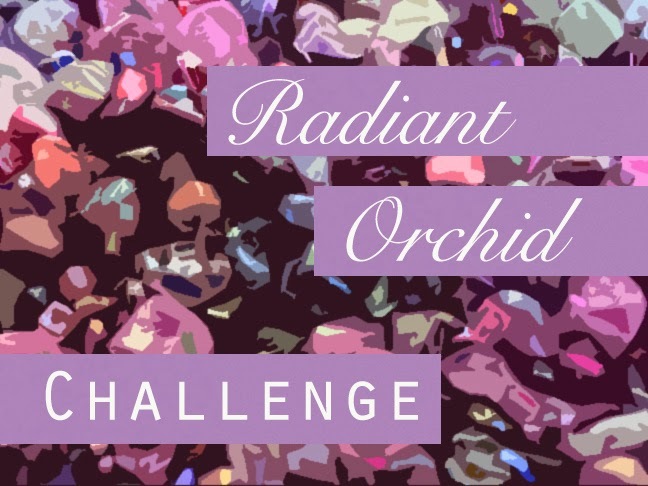 Allegory Galleries Radiant Orchid Challenge has begun! 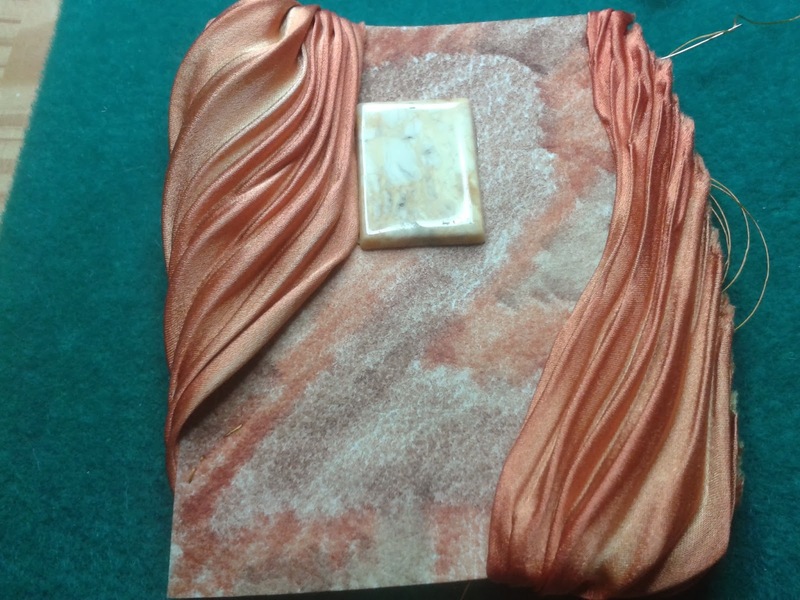 Pine Ridge Treasure's Winter Sparkle Blog Hop on the 22 of February! 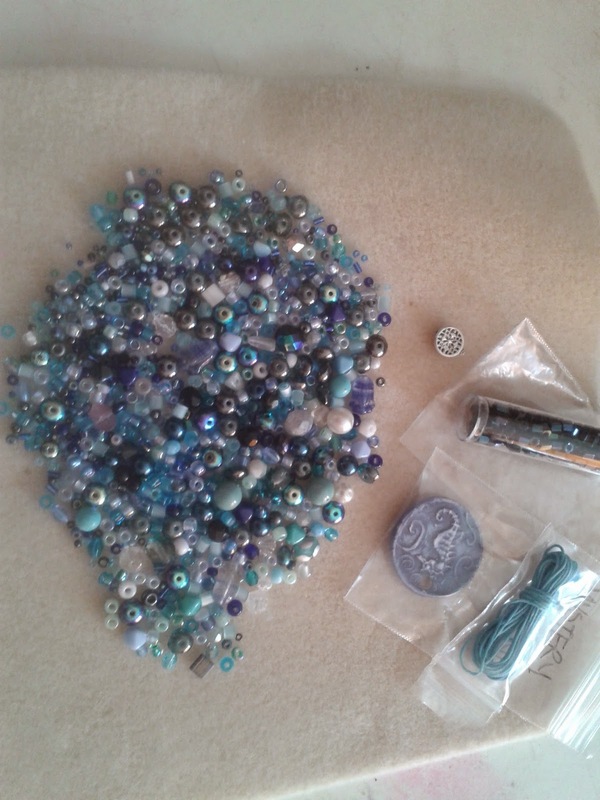 Lori Anderson's Bead Soup Blog Hop will be announced soon, along with some other challenges she has planned! That is all for now (isn't it enough!) Actually, I do have other things planned for this year, but all can NOT be revealed just yet...so stay tuned! 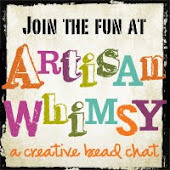 Whimsical Monkey's Earring Swap Blog Hop! The Third Reveal is Finally Here!!!!! 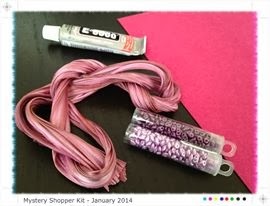 Summer Colour Surprise Blog Hop!